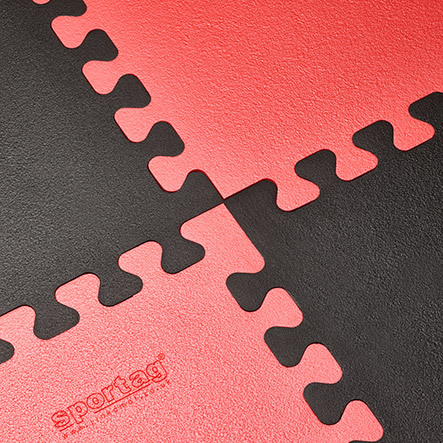 SPORTAG Linkamats are designed to be better than the competition. We use an advanced technology foam which combines superior strength and outstanding cushioning. There is quite simply no other material offering a comparable performance. Lightweight and durable, the mats are waterproof and washable. The material is biologically and chemically inert, and resists bacteria. Full safety data sheets can be supplied on request. It’s not just the material that makes our mats different. The links on our mats are unique – they’re deeper than the links you’ll see on most other mats. This means they stay stronger for longer, and will continue to give an exceptional link between mats. Available from stock in standard colours of black or red, our mats are normally available in one size – 145cm x 92cm – and two thicknesses – 29mm and 42mm. Other colours can be supplied on request – please contact us to find out more. Corner and edge trim pieces are also available, and are ideal for creating visual borders around the edge of mats, or between mat areas. Again, the standard colours are black and red but we are happy to quote for other colours on request. We deliver throughout the British Isles, either with our own transport or by carrier. Normally we will deliver during working hours, Monday to Friday, but will always try and accommodate special requests. 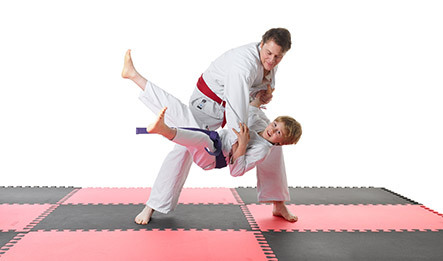 Don’t forget that clubs usually qualify for a discount, so if you are thinking of replacing your existing mats or are setting up a new club, please do give us a call!